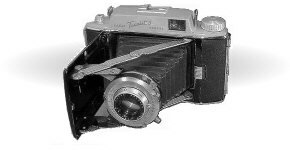 The Kodak Tourist was the last in a long line of medium format folders that had included the Junior and Senior Six-20 series, the Vigilant and Monitor series in the U.S. and several models produced in the Nagel factory in Germany. So why is this rather modest camera included here? It certainly isn't at the forefront in engineering and styling. It has no rangefinder as its German cousins, the Kodak Regents did, and it lacks their elegance of design. It doesn't have the fit and finish of an Super Ikonta C. And it has PLASTIC. It is here primarily because it has a decent coated lens that is very sturdily braced, its leaf shutter is quiet, and and the Tourist is a lightweight,compact package that produces a large negative. It is also very available and affordable, not criteria I have used for other selections on this site. The major attraction of the Tourist is its compactness and negative size. It makes a 6x9 negative, but is lighter than a professional 35mm SLR and more compact when folded. Consider that a 6x9 image is over 600% larger than a 35mm image. An 8x10 enlargement from a Tourist negative is about 4x, while a 35mm negative must be enlarged 8x. It takes a tremendous amount of modern technology in lens and film design to overcome the image flaws that creep into this magnification rate. This final version of the Kodak folder was a very sturdy camera with a metal body and strong struts with positive locking action. The only significant plastic in the design is the finder shroud. There was a broad range of lenses and shutters offered starting with the Kodets of f/12 and f/8, to the f/6.3 Anaston in a Flash 200 shutter, the f/4.5 Anaston triplet in a Flash Kodamatic shutter, and an f/4.5 Anastar, of the Tessar type, in a Flash Supermatic shutter. For its piece de resistance in the later Tourist II, Kodak mounted the Anastars in the Synchro Rapid shutter with a top speed of 1/800. The Synchro Rapid had special double-ended blades to achieve this top speed. Unfortunately these were not the most unreliable shutters. The Anastars (originally called Anastigmat Specials) approached the quality of Ektars of the period except in correction for chromatic aberration. The Tourist replaced the Six-20 and Monitor, which all had flip-up finders. The Monitor was made through 1948, when the Tourist was introduced, and it is possible to find either lens on either camera, though these variations might be due to repairs rather than manufacturing. The Monitor with a f/4.5 Anastigmat Special or Anastar is also an attractive shooter. Chris Perez has published lens resolution tests for an uncoated Anastigmat Special used on the Kodak Special Six-20 , a contemporary of the Monitor. The most obvious lack in the Tourist design is a coupled rangefinder, which is not trivial on a camera with a 100mm lens. The finder housing was redesigned for the Tourist II, covering most of the body. The rear finder window was shifted to the left on the Tourist II and the viewfinder path was through a mirror arrangement of the sort used in rangefinder configuration, yet the Tourist II does not have a rangefinder and this change only seemed to significantly reduce the finder's image size. Perhaps the designers anticipated a range finder which never made it to the final production model. Arguing against this is the complexity of designing a coupled rangefinder. This considerably increases the manufacturing costs, which probably explains why the Tourist was offered with this quality lens sans rangefinder. Like other Kodak 6x9s, the Tourist uses 620 film. The dedicated Tourist collector can reroll 120 film onto 620 spools, so this is not like owning a 616 model which requires buying large rolls of 70mm film for rerolling. It also had an accessory that allowed 6x6 or 6x4.5 on 620 and 28x40mm on 828 film, creating 2x2 slides with a 2x telephoto. The model with the Anastar and Synchro Rapid shutter fetches the most at auction. At this writing (2002), these seem to go for about $75 on eBay. Because a high proportion of Synchro Rapid shutters may be broken and perhaps unrepairable, buy with caution if you want to shoot with it. The Tourist II with a f/4.5 Anaston and Kodamatic shutter 1/25-1/200 is a good picture taker and can be found for about $25. The Tourist I with the f/4.5 Anastigmat Special or the later Anastar in a Supermatic shutter increases the range of shutter speeds and provides a better lens design. Check to see that the lens is a hard-coated or 'Lumenized' version with the symbol following the lens serial number. Because of its greater availability, my choice would be a Tourist I with an Anastar in a Flash Supermatic shutter. Getting a good 6x9 folder is a matter of tradeoffs.